The Harbour Town Links is one of the most beautiful courses in South Carolina and with Pete Dye and Jack Nicklaus as its designers it comes as no surprise. The course is an annual host on the PGA Tour for the RBC Heritage, and has collected over the years numerous different awards, for example in 2010 Golf Digest rate it as the 13th best course in the USA and in a survey conducted by them the PGA Tour professionals rated it as the 2nd best course in America. The course is narrow with overhanging pine trees and oaks littering the fairway it is not just the sea you need to watch out for as the rough here can be just as punishing. But fear not because if you are not playing as well as you would like to then there is always the beautiful scenery to admire throughout your round. The famous Pete Dye worked in close consultation with Jack Nicklaus, and the result is a championship layout to test the creativity and imagination of the finest golfers; Hilton Head is among the shorter courses to regularly stage PGA Tour events, but the fantastic variety of Pete Dye's design ensures sufficient difficulty. Harbour town links is the only course is South Carolina to annually stage a PGA Tour event; The RBC Heritage which usually follows the week of the Masters. The event attracts some of the biggest names on the tour and in recent years the likes of Branden Grace, Matt Kuchar and Graeme Mcdowell have been victorious here. It is not only in recent years that golf's biggest names have lifted the trophy at Harbour Town. The first time it was ever held at the beautiful links it was won by no other than the late great Arnold Palmer. The course is notorious for producing some low winning scores with 18 under par winning it on 3 occasions, the lowest score to win at Harbour Town Golf Links was shot by Brian Gray in 2009 when he won with 22 under par. 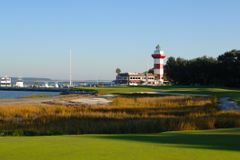 Bordering the beautiful Calibogue Sound - often buffeted by brisk coastal breezes - Harbour Town is best known for its closing hole; guarded over by the iconic lighthouse, the 18th is one of the world's most celebrated holes, and is worth the trip to Hilton Head alone. It's ‘do or die' at Harbour Town's finishing hole - step up to the plate and take on the water that guards short and left. The course is a PGA championship tournament worthy. Really pretty, nice and amazing to play. Great course but playing it just less than 3 weeks before the PGA tour event, the preparations/stands marred some of the views.